I’ve faced these questions before–sometimes, I’ve been the one asking the questions of myself–and until recently my answers have dwelt on my personal experiences or my love of the ritual and Tradition (yes, capital T) of the Catholic Church. But this past year has challenged me in new ways, and on one particularly bad Wednesday in November, I went searching for a better answer since I felt lost and depressed and very confused. As I usually do, I turned to my bookshelf for consolation and hope. I was looking specifically for a book on the prophets by theologian Walter Brueggemann, The Prophetic Imagination, which had helped me in the past. This is where the book used to be! 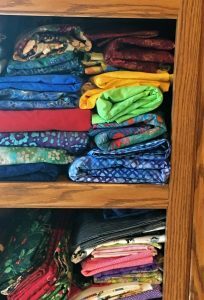 But having moved my library around in recent months to accommodate more quilting supplies in my former office-turned-sewing room, I couldn’t find that book anywhere. Instead I picked up a collection of his writings on the psalms, The Psalms and the Life of Faith, a book I had been meaning to read for too long. There, in an essay entitled, “Prayer as an Act of Daring Dance: Four Biblical Examples,” I found help, and a new metaphor to explain my sometimes unexplainable relationship with God through the Catholic Church. Others have used the metaphor of dancing with God in ways that really don’t speak to my experience and understanding of God. When one dances with God, some folks say, you need to surrender all and follow God’s lead. God is the one in control, the one who never changes or needs to change. God knows all the steps of the dance (God is the master choreographer), and the only thing a believer must do is to be humble and bend to God’s will. Over the course of my life, I’ve tried to fall in sync with this notion of God (and of Church–the attitude is very much like the understanding of pre-Vatican II Catholic theology, where the ordinary person’s role in the church could be summed up by the cliché, “Pray, Pay, and Obey”). But as the first-born child of Christmas-and-Easter Catholic parents, I lacked the conditioning many of my peers had in Catholic schooling and regular church attendance. In place of a solid grounding in being an obedient Catholic, my parents raised me to be an independent thinker, a woman who always knew she had gifts and had better be using them for others. I’ve told my children that in one sense, I was being a rebel by taking my faith seriously. My parents wanted me to quit attending religious education after I was confirmed in the sixth grade, but I refused. I had a hunger to learn more about God, and as a preteen and teen, it helped that pursuing God and getting active in our parish annoyed my parents to no end. My youthful zeal, and the influence of some Charismatic Catholic friends in college, led me to an extended phase in my early adult years when I tried to be a docile and obedient Catholic who followed all the rules. During this time, I got married, finished my graduate work and embarked on my first career. And while my faith in God and my identity as a Catholic sustained me through many challenges, in the end, I only ended up feeling like an frustrated fraud. I couldn’t find a way to live authentically as a submissive wife, especially when my husband insisted that I give up my career so that he could have the one he wanted. I tried to learn more about church doctrine and found that I couldn’t understand some positions. It seemed that some of my Catholic friends expected me to simply assent without understanding, and although I tried, I just couldn’t. I agonized; I prayed. And eventually, I forged my own path, a path which caused me to lose some of my Catholic friends but opened me up to many more. God in the covenantal traditions of the Old Testament is a free partner, not locatable or predictable by place or posture. . . . In this “dance” the two partners take each other seriously and stay on the dance floor with each other. But that commitment is the only factor that is constant, mutual, and serious. Beyond that, everything is open for both partners and yet to be decided. The partners dance in many postures, many locations, many varied relationships, in which nothing can be counted on from the other one, except that each takes the partner seriously on the dance floor. The music may change, Brueggemann says; the partners may have times of intimacy and times of freedom, and either one may “take initiative and be responsible for the relationship.” The dance is not choreographed ahead of time by God alone; instead it is discovered as the two dance together, and either partner may improvise at any time. What Brueggemann doesn’t discuss about this relationship of dance (because he is exploring how prayer in the scriptures can be understood as dance) is that dancing is a skill that depends on practice. I know this well as a former “dance mom.” My daughter has always loved to dance, but when she first began to take formal dance lessons, she struggled a bit because she didn’t have certain skills yet. As her loving godmother said diplomatically after viewing my daughter’s first Christmas recital, “She is very graceful, from the waist up.” By the end of the first year, the “waist up” qualifier no longer applied, but the more she learned, the more challenges she faced. And sometimes, her body rebelled initially from learning a new way to move. But with persistence, practice, occasional setbacks and determination, she learned and grew and became a better dancer over and over again. This is what I have come to know about my life of faith. At times, God has led me, but God doesn’t demand that I surrender my own individuality or my own will. Sometimes, we dance side by side; other times, I spin off on my own. And while sometimes that spinning leads me to collapse in a dizzy heap, only to gratefully accept God’s hand and the invitation to try a different type of dancing, sometimes I believe that God takes delight in my solo moments, perhaps even doing God’s own version of my dance. God delights in all God’s children, even a headstrong, questioning dancer like me. And God doesn’t have everything choreographed in advance; sometimes–perhaps often–God changes the music or the steps to better accompany God’s loved ones in their chosen dance. It is worth staying in this kind of dancing relationship, even during the difficult times. This is why I am still a believer. And this perspective also helps me to deal with those times when I, myself, wonder why I stay Catholic. I tell myself that sometimes the Catholic Church spins off in directions hard to understand, with dance moves that embarrass or confound me, but I know from my studies that it has done so in the past and eventually found more sure-footed steps. After all, a church is full of many dancers. And God loves them all and has patience when the collective dance is a dizzy mess. Eventually, the song of the moment ends, the participants take a breath and begin anew. A new dance begins and no one–not even God–knows all that it will encompass. As long as we “take each other seriously and stay on the dance floor,” we are doing what we were created to do. This is what I plan to share in the coming year. I hope you will join me. Shall we dance? What metaphor would you use to describe your relationship with God and your church? Has it changed over the years, and if so, how? And how do you feel about changes? Feel free to share a bit of your reflection or your comments in general. Nancy, I appreciate your thoughtful writing, and I’d love to follow your post when I can! I’m still finding my own dance, and find God, the Source of Being, to be a wonderful dance partner. On the other hand, the Church is dancing on shifting ground that often makes it seem wrong for me to stay connected and continue this dance. But the music keeps playing, and I can’t resist listening. Sometimes, I sit out for the number and listen. Sorry it’s taken me a while to respond. I’m still learning this medium of communication. But I like your extension of the imagery to see the Church dancing on shifting ground with you occasionally sitting out to listen. I’d like to think that it is the Spirit working with our limited human imaginations that brings about some of the shifting ground. The Church is truly the Body of Christ, and at times it (as an institution of human beings) forgets that God is God and the Church in not, that the Church may have to be open to seeing deeper or beyond its longstanding understandings, if that makes sense. It makes sense that we might have to sit and listen a bit before rejoining the dance; we can only hope that the institutional Church does the same as it continues its dance with God.